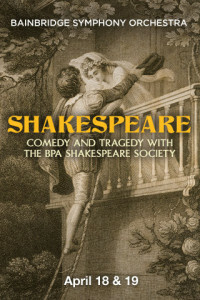 Shakespeare: Comedy and Tragedy with the BPA Shakespeare Society, to be performed at 7:30 pm Saturday April 18 and 3:00 pm Sunday April 19 at BPA, will feature the Bainbridge Symphony and Youth Orchestras and members of the BPA Shakespeare Society. In this podcast, BSO conductor Wes Schultz joins Tom Challinor, Director of the BPA Shakespeare Society, to tell BCB host Channie Peters about their upcoming concert. The program will feature readings from complementary plays, Shakespeare-inspired pieces from a wide range of composers from different periods and genres, and BSO’s 1st Place Young Artist Concerto Competition Winner Andrew Barnwell performing Grieg’s Piano Concerto in A minor. The runner-up in that competition, Shintaro Taneday, will perform Lalo’s Symphonie Espqgnole, 1st movement, and the Sunday concert will include a pre-concert chat at 2:15. The Bainbridge Symphony Orchestra’s Youth in Music initiative is sponsored by Wicklund Dental. Tickets for these exciting events may be purchased at the BPA box office or online at bainbridgeperformingarts.org. Credits: BCB Host Channie Peters; BCB audio tech and editor Barry Peters; BCB publishers Diane and Chris Walker.